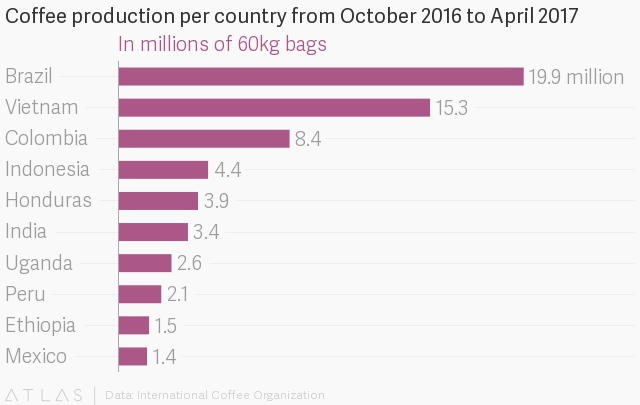 Ethiopia could lose 40% to 60% of its coffee cultivation areas by the end of the century due to global warming. Though Ethiopia is only the ninth largest coffee exporter in the world, coffee generates its largest share of export revenue and employs millions. But warmer climates are expected to kill crops, make beans lose quality, and help spread lethal fungus diseases. Ethiopian growers could avoid that loss by moving crops to higher—and colder—areas. Warmer climate and changing rain patterns are expected to destroy half of coffee growing areas around the world by 2050.